What is your take on 1 Corinthians 3:10-15? Paul seems to imply here that one who has been born again might live a life that is NOT about seeking and doing the perfect will of the Lord (building wood, hay and straw on the foundation), but still be saved (“the builder will suffer loss but yet will be saved; even though only as one escaping through the flames”). So is it possible for one to live a life in which he/she keeps a saving faith in the Savior, but does not live for eternal things, but rather to store up earthly treasures? Isn’t that what this part of the Scripture seems to suggest? Thank you for your reply! Paul is referring specifically to sincere believers who teach wrong things about Jesus and practice vain religious works, and yet they live morally upright lives. In that case, they themselves may be judge worthy to be saved in the end, but they will receive no reward for all their religious work. It will all have been in vain. May God grant us the grace to both live holy lives and minister the gospel acceptably! Today’s Pearl spoken by Preacher Clark long ago is right in line with what you spoke on during our last reading of Acts. Paul was free to observe or not observe feasts and holy days. And to say circumcision counts for nothing and you have fallen from grace to be circumcised and then turn around and circumcise Timothy. Are we free enough to be water baptized if that’s what the spirit is leading us to do in a certain situation or are we too superstitious and bound up that we could not do it? We really have to have a connection with God to feel what he wants us to do today. And not just what he said before in the past. Because it may be something different. The prophet Malachi foretold of the Messiah’s coming by saying, “The Lord whom you seek shall suddenly come to his temple.” This happened when the Son of God, in the shape of a harmless dove, “suddenly” came from heaven and lit upon Jesus, Mary’s son. Therefore, the Lord whom Israel sought was still in heaven when Jesus was born. Jesus was not Lord when he was born. He was made Lord and Christ when the Lord and Christ from heaven came into him and the Son of God from heaven was blended with the son of Mary from Nazareth. I sure do love this book! I’m so glad you had time to write it and edit it and print it again! I read through the first parts of chapter 8 yesterday and was in tears telling about it. I read about Josiah becoming king and having a heart to want to do right and live right, and having a little bit of knowledge of God, with just a few people around him that knew anything. There was something in his heart for God from the beginning, and when Moses’ law (that had been lost for decades) was found and he read it, his love for a truth that he really didn’t know grew all the more! He didn’t think things about God and then read real events from Moses’ law and think, “Aw man, that’s not how I thought God was”, or “Oh no, I didn’t know He’d be that hard!” He loved everything he read, and it made him change things! Reading that story made me want to be sure I had a heart that is free to believe whatever God tells me. It also made me think about my sons, and raising them with a true heart for God…and a love that will grow with every new thought and experience! There is a really sweet feeling to a heart like that. Where can you find such men? I read about the sweet feelings Josiah must have had, reading in the law about God telling His people how he would take care of them if they would only obey and love Him. Then his feelings changed to anger because of what was going on! Then, when Josiah read about curses from God if people don’t love and obey Him. Then the last thing I read before my boys woke up from their nap was God saying that if people would just admit what they did and turn from sin, He would take care of them and send them pastors after His own heart! I felt so thankful for you, and I had an overwhelming feeling of thankfulness to even be here, to even read what I was reading, to know what I know, to feel what I feel, to have feelings when something is wrong and have a desire to fix it. Somewhere in all that, I stopped reading and thanked Jesus for eyes! Eyes to see my children and take care of a house and family. And for ears to hear my family. And for a body that works to take care of them. And for help financially lately with everything … perfect in timing, always! Reading Josiah’s story triggered a strong desire to make my every day, and everything I do, reflect how thankful I am. I’m pretty sure most of this book has just made me feel so thankful, and feel loved, but it was still good yesterday. Eleven years ago, I was in a car accident that probably could have and would have killed me … “but God”. How can I not be thankful, and live a life worthy of the blessing of life that He has given me?! My prayer now is that Jesus will help me do that! How do u deal with Christmas? Thank U. Also, what identifier/s do u prefer to “Christian”? I hope that you and yours have a very merry Christmas! Secondly, I leave identifiers to those who want to identify me. That way, the hidden thoughts of their own hearts are revealed. Jeffrey, How would you identify me? Loved your preaching tonight John 🙂 I like what you said about the slot machine, “God robbed a one-armed bandit that night!” Ha ha! Only God knows how to deliver us and save us from our own selves. We have to know God and trust his spirit when it tells us to do something. 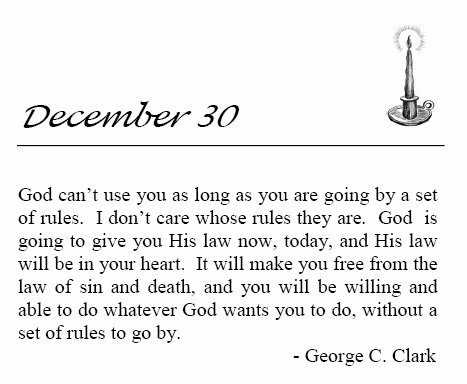 What is God’s will for us? What does he want us to do? Thank you Jesus! Let’s go with Jesus!! I really like your translation of Acts, John (and your helpers). It is so easy to follow! And thank you for reading it and explaining it to us. Just wanted to tell you that we thoroughly enjoyed the Acts reading this weekend. Being in translation before, I know that translating the book of Acts required a lot of work. This time around, for me, the apostle Paul’s ordeals were certainly brought to life. What a warrior for the Lord! Thank you very much for all that you do for us.